class FunctionInfo Combines all the information to uniquely identify a single function in one object. Definition at line 22 of file FunctionInfo.h. Constructor. Combines all the information required to identify a function. This constructor allows the user to define everything. 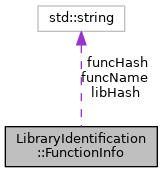 [in] libHash Unique Hash of the library this function belongs to. The Library should already be in the database. Definition at line 38 of file FunctionInfo.h. Constructor. Combines all the information required to identify a function. This constructor constructs the hash from the SgAsmFunction node. Note that currently on FNV hasher is used. This should be an option. Definition at line 57 of file FunctionInfo.h. Definition at line 78 of file FunctionInfo.h. Definition at line 99 of file FunctionInfo.h. Constructor. Only takes the hash. (Never used? Nomrmally there is a binaryFunction availible as well.) Rest to be filled in from matching in the database. Definition at line 114 of file FunctionInfo.h. Constructor. Only takes the hash and the binaryFunction. Rest to be filled in from matching in the database. Definition at line 127 of file FunctionInfo.h.